Reader Guideranger provided a more visual format up to the exotic version for those who prefer. You can pick from a selection of stats as an one time option: Hearty, Honed, Hunter, Ravaging, Rejuvenating, Strong, Vigorous. The stats reset when you upgrade it and you can pick your stat again. You can pick from a selection of stats as an one time option: Apothecary, Assassin, Carrion, Cleric, Knight, Rampager, Valkyrie. The stats reset when you upgrade it and you can pick your stat again. You can pick from a selection of stats as an one time option: Apothecary, Assassin, Berserker, Carrion, Cavalier, Celestial, Cleric, Dire, Knight, Magi, Rabid, Rampager, Sentinel, Settler, Shaman, Solder, Valkyrie. The stats reset when you upgrade it and you can pick your stat again. You can pick from a selection of stats as an one time option: Apothecary, Berserker, Berserker and Valkyrie, Cavalier, Celestial, Cleric, Dire and Rabid, Knight, Precision Power Toughness, Rabid, Rabid and Apothecary, Rampager, Solder. The stats reset when you upgrade it and you can pick your stat again. What stats you picked does not determine the color. It will remain yellow and won’t change colors until you make the Dynamic, Synergetic or Static version. Note it is highly recommended that you make the Gift of Blades with 500 Leatherwork since 15 Elonian Leather Square is cheaper than Damask or Deldrimor. Backpieces are not restricted by armor type so it doesn’t matter which crafting discipline made it. Glob of Coagulated Mist Essence: Drop from fractals, can also make them with (5 Vial of Condensed Vial Essence, 1 Glob of Ectoplasm, 1 Mystic Coin, 1 Pile of Crystalline Dust) or (1 Shard of Crystallized Mist Essence, 1 Master Salvage Kit, 1 Mystic Coin, 1 Pile of Crystalline Dust) in the mystic forge. Gift of Ascension: 500 Fractal relics, purchased from the vendor inside Fractal of the Mists. Awesome. That would look great on my engineer. Wonderful… Another ugly item that will take up room in the bank on the off chance I build a character who needs spider legs growing out of his back. They could have made this look good, but failed horribly at every level of the item. how many ingots of each? how to make Quad Spinal Blades? Farmed alot, can make back pack now. Just heard.. i can’t use it in PvP so was a waste of my time.. I don’t want this on my PvE Gear. They’re adding the ability to use PvE armor in PvP (and vice versa) soon, as part of the process that’s removing Glory as a currency. So you’ll be able to use it in PvP pretty soon, probably mid-March? There are posts about it on the website. IS there stats on this back ? yes u pick the stats when u first equip it. How do you make the Dynamic, Synergetic, or Static ones? Here’s hoping they drop further by the time this event is over (stacking blade shards for the time being). what stats make wich color? so you can pick the stats for each of the different colors, but I can’t figure out how you make a specific color. What’s the best way to farm blade shards? I just did the defense twice and I have 8. How the hell do I get hundreds? That’s a preview code. If you type that into chat, you can then right-click it to see what it looks like on your character. Nice to know that only players with who have the gold for ascended crafting get the cool looking ones. Its like 80g for 1-500 armorsmithing and another maybe 50g for the mats for the ascended backpiece here. I made 30g already tonight off of drops from this no remorse for people complaining about gold go farm. they are crafted by mystic forge so you can get the exotic one and maybe gather the ascended mats bit by bit after the patch? What I’m doing. Must…have….green one…. and how many hours of farming was that? granted I’ve been salvaging the greens but, after WP and armor repair, I’ve made not even 1g tonight. Imagine that, the coolest/most unique looking items are rare and expensive in a cosmetic endgame. Looking good, though impossibly expensive for me. any idea about how to infused ? what’s the stats after infusion? Looks like you cannot make them colored yet. Stuff like “Gift of Wine” and the Power Cores for colors are not yet in the game as it looks. At least no one can find them. They have been datamined of course. Note that the name of the pack are connected to the Asuran path, likely that the power cores come from phase 2 of this living world in a few weeks, aka lets kick Scarlet face. I think yes like all the other skins. I think because the smoke effect of GW2 are pictures with transparent maps so when they become invisible they start to show. But im not sure about my theory. how to obtain the other colors? If I wear the backpiece can I still upgrade it? Stupid question maybe, but isn’t the Power Core the thing we got from Probes ? 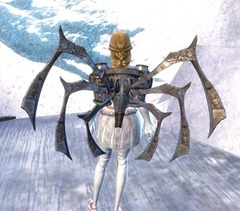 Dynamic Tempered Spinal Blades is soo beautiful *_* i just wish the actual thing that sits on your back wasnt so big, it will probably cover up a lot of my weapon ? Hey Dulfy, you recommend to craft the Gift of Blades as Leatherwork. You can craft Elonian Leather Squares also as Tailor. Does that mean we can’t make Gift of Blades as Tailor with Elonian Leather Squares? As Tailor we have to use Damask Bolts? can i use this, choose stats and later on put it into the mf to upgrade it further more? it just says, that its not allowed to transform, so i guess: yeah? ive never made a back item or acquired one (besides that backbrace from a personal story mission) what do you mean by choose a stat? how do we do that? Double click on the item as if you were going to equip it. It will first prompt you to select the stats at that point. Any word on whether or not these can be come (Infused)? Im about to choose stats on the Tempered Spinal Blades, any idea if the color depends on the stats i choose? im really scared because i want the red one. You CAN get the power cores, they were used in the last living story. “power core” IS obtainable, They were used in the last living story to open Scarlet’s lair so all of these recipes ARE craftable now! Cost me upwards of 200g because I only have one main at 500 crafting for one profession… and that was tailoring T.T… I did notice large fluctuation in both the steel and leather ascended material on TP so be cautious. So this one can be infused, but Light of Dwayna cannot? Anyway, those back pieces are really looking good and this is exactly the kind of progression they should aim for. You start with a basic item and improve as far as you like, but no progress is destroyed along the way. Sorry I’m new to this, I have the blue print, do I only get the one with out blades, or can I eventually make the one with all the blades on it by upgrading it? Each step requires you to have the previous item. 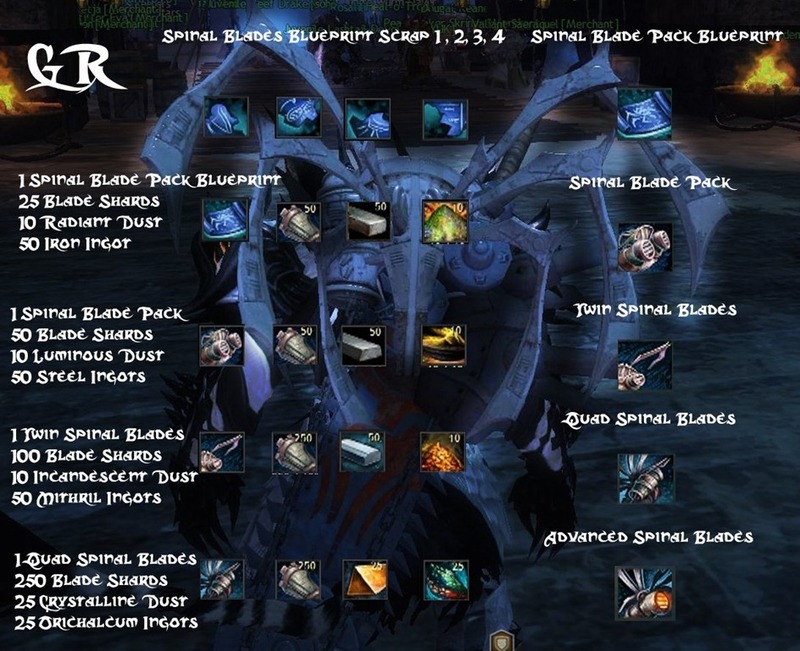 To make the Two Spinal Blades, you need to have a Spinal Blade Pack (the basic version) and so forth. So you start with the basic version and can upgrade it as far as you like. You can buy the 4 blueprints pieces at the trading post, because they are not account bound so ppl can sell or buy them. can i ask where we can now find a mystic forge? The Mystic Forge is now at Vigil Keep in Gendarren Fields. Its also in the airship. Everywhere everyone’s said here, but also in the Borderlands in WvW. 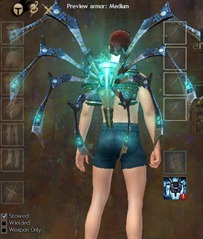 As they are 3 Tempered Spinal Blades – Ascended backpack, maybe the color depends on the specific slot. Offensive Slot, Defensive Slot or utility slot. 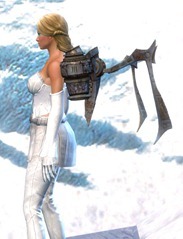 That would give a backpack with the slot we want. Thank you, anyway i don’t think i’m gonna farm too much of these, i don’t really like these skin. If only they were smaller a bit. The infused upgrade is simple, it’s the same as others. Ectos, Gift of Ascension and a glob of coagulated mist essence + ascended backpiece. Are the stats fixed when chosen, or do they re-set when the back piece is upgraded? Help. What’s a Blade Shard? If I throw a gem in the exotic version then upgrade it to the ascended will I still have the gem? Anything besided the backpiece we can use bladeshards on I have a ton left over. Your picture is wrong. You said it need 25 shards but have the icon is for 50. Same for 100 where the icon is for 250. 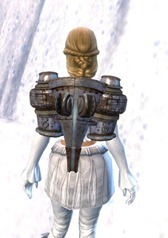 This back piece was way to easy to obtain. I had an ascended version after 3 hours. If you have insane amounts of mats and/or Money, sure, but then everything is easy to get. They need to balance this stuff. Any ideas how to infuse them? I think the infused version consists of: 250 Ecto’s, glob of coagulated mist, gift of ascension and the backpiece itself. All items are accepted at the forge to create something, i do not have enough ecto’s to complete the recipe. I was wondering if these recipes will stay around after the event is over? If I am to make the exotic version of this backpiece and also make the gift of blades, but then the event ends before I am able to level my crafting to 500 and make the other 2 items required, will i be able to get them after the event is over and then turn this backpiece into ascended even though the event is over? You should be able to. Just remember to buy the recipe now, so that they won’t remove the recipe vendor. 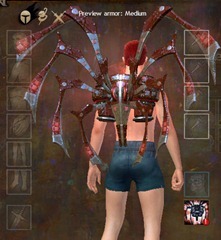 The key to this backpiece is the blade shards you get from the events and mobs inside LA. All the other matz can be acquired elsewhere. If my math is correct it takes 925 total shards to got from blueprint up to tempered (ascended). So collect and stockpile the shards during the two week event for as many backpieces as you plan to make in the future. That is not true. You actually can get the blade shards outside LA. You can learn most recipes before you have the rating required to use them (although there might be exceptions, given that I’ve got a recipe with a level requirement–not even rating requirement, but level requirement– sitting in my leatherworking alt’s inventory; anyway, you can certainly learn this recipe at any rating) so your best bet is to get the recipe and have your character learn it, then just craft it once you’re got your rating high enough. Mystic Forge recipes are only removed in special circumstances (like the Halloween stuff being redone stats-wise and reintroduced, and temporary recipes designed to remove excess materials from the game and balance the economy being removed once they’re no longer needed), so you’ll definitely be able to stick it all in the Mystic Forge and get the Ascended version even after the event is over. Will the Static,Synergetic and Dynamic one forged or crafted? thinking that a acendend backpiece is 100 ~ 120g, is it worth? or it will take more than 120g? 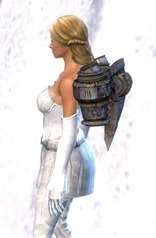 thinking that a acendend backpiece is 100 ~ 120g, is it worth (if i buy all the materials except that ones dropped in the event)? or it will take more than 120g? I have the exotic version but if I equip it can i still upgrade it ? Yes, as long as you don’t transmute it onto another back piece. Anyone Else think the Static Tempered Spinal Blades glow a little less than the other two? Red is a less energetic color than Blue or Green, so it’ll seem dimmer. Anyone know when the Power Core and Gifts of Wine coming?? someone pinged a green one in map chat, so how can you say the colors can’t be made until next living world release? The chat codes are already in game, that doesn’t mean the person who pinged it owned it. Do you not understand what chat codes do? can you make the colors or ascended without being a 500? The code for the green wings are wrong. When I type it, I get the golem banker. That’s weird. Wiki has the same code. I know infused code works since I’ve tried it. Haven’t tried non-infused chat code. Can anyone tell me if I infuse the ascended version, will it keep it’s infusion status and carry it over when I use it to forge the Static version, or will I have to re-infuse the Static version? probably like the fractal capacitors, any mods you have in it when you upgrade will be lost. Thanks for the reply! I probably won’t infuse it until the colored ones come out then. Does the [soulbound and stats] reset back to [accountbound and selectable stats] after you go to the next tier? This is definitely the case. Each time you put it into the forge it becomes account bound again and can be moved between characters.When you equip it, it gives you a warning that it will become soulbound. What about the stats? Do they become selectable again? The backpiece doesnot before soulbound even after choosing the stats, I am able to equip it on another character. Which version is this? Fine/Masterwork? I have the exotic version, no stats picked yet, still account bound. It is the exotic version, after I picked the stats it is still account bound. What if i selected stats for Tempered Spinal Blades – Ascended and i want it infused can i select stats again or it will remain. Is this only for level 80 characters or anyone can do it? The blueprints are tradeable and able to be brought on the trading post so anyone any level can get them. I think Blade shards are for any level too. Actually the blueprint piece are tradable, the Full Blueprint is account bound. only certain versions of the back item will be for under lvl 80, in reality, you can’t get the FULL ascended one till you have 500 crafting in tailoring/leatherworking/or armorsmithing. Can anyone confirm if Sentinel is an option? Yes, sentinel can be selected from the list of stats. Is the infused version any different (visually) than the normal ascended version? no berserker stats on ascended? saw on wiki that the recipe for Gift of Blades can be purchase from the mystic forge attendant for 5g. Is there anyone who can confirm this? It can be, I even mentioned it above..
new to crafting so my question is probably pretty obvious. Where are the advanced spinal blades crafted? What do you get on each one, in particular the Exotic version? It works out to about 17.5g to make Exotic. I would also like to know what the actual numbers are, so I know whether or not it’s worth making ascended. If the numbers only increase by 2 or something, I’m not going to bother. No skin is worth 100+ gold. You are still restricted to the stat combinations based on prefixes and suffixes of courses. It’s usually for people who have nothing else to do and want only gear progression even if it’s minimal, but that’s just my opinion, exotics in all slots are still viable. Finally got someone to tell it. It was so hard to find out. They all seem to say u can choose but that not what we needed to know. Just realized that final versions are named after the 3 colleges of the asura race. Hi Dulfy. Can I get a confirmation with the Sentinel Stats? I’m just looking at this with a blank face. Sentinel is available on the exotic version. maybe report it as a bug on the forums. I cant believe this would be intended. Just a question. If I infuse my piece back, so to put an infusion +10 for example. When we can put the desired color on March 4th is what 10 will be retained or infusion is destroy ? As the mystic forge creates a new object, infusion will very likely be destroyed. If you equip the ascended version, it becomes souldbound, doesn’t it? Can I wear it in the meantime while I’m gathering the materials to make the ascended version? If i gather all the materials needed that come from the event in LA (like blades, and recipes), will i be able to craft it afterwards (after the event ended in la)? Also, how many blade shards are needed for an ascended one in total? And is it anything else than the blades that are only possible to get from the event? To clarify the above, 500 blade shards are needed to upgrade from the exotic version to the ascended version. 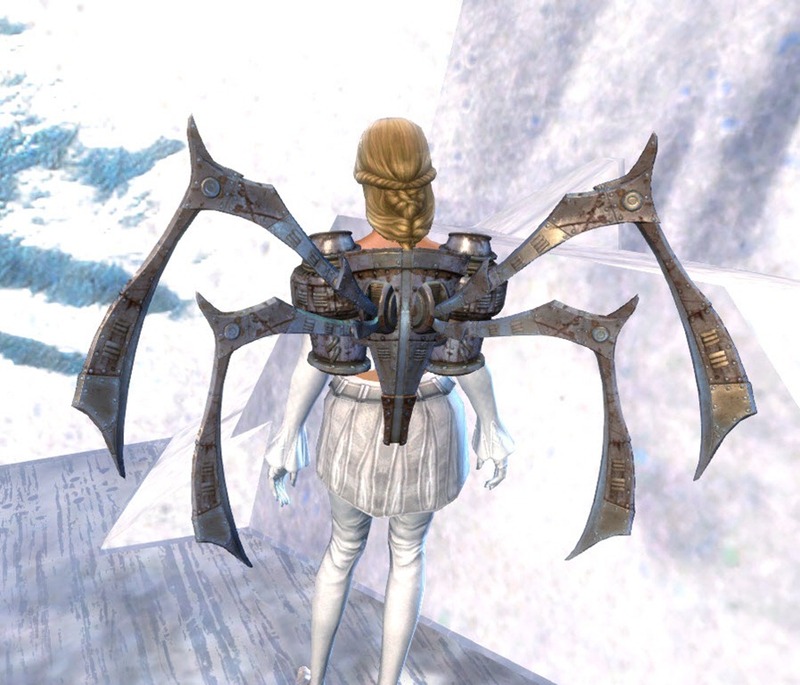 In TOTAL, as per the original question, 925 blade shards are needed to fully upgrade each backpiece. Yes, if we do not need Blade Shard for the Dynamic, Static or Energetic version. Red glow actually appears weaker even in real life – that’s why it’s usually used for alarm clocks and probably military purposes too, although I can’t claim any special expertise there. If I craft the ascended back with a character , can I transfer it to another character through the bank? On the official wiki, the ascended and infused one said Account Bound and Soulbound on use, is that true? Why do we have Obsidian Shards in shopping list for the ascended I don’t see any use for it? 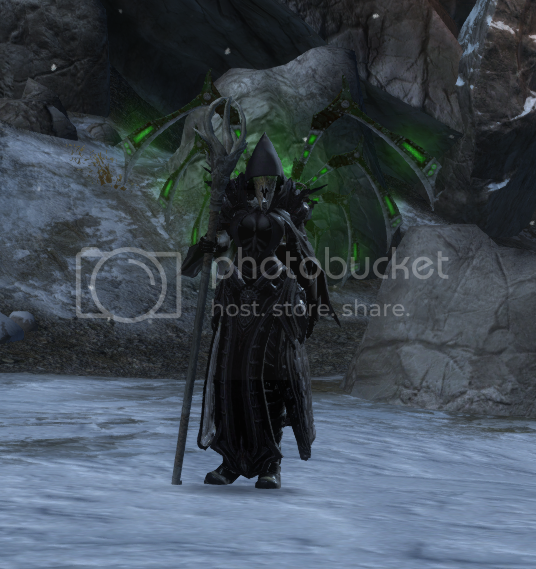 So if i wonna INFUSE this what do i need cose u write it require 1 TEMPERED spinal blade.. Tempered?? 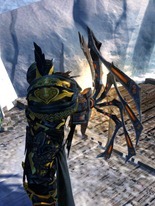 Tempered Spinal Blade is the name for the Ascended Back piece. Is that mean that i have to do Ascended back piece once again???? What augments take the base stats of 22/16/16 to Exotic totals 47/31/31? Is that a crest or jewel. The base stats should be 22/16/16. It was the wrong stats. I should better ask what is the stat of this infusion slot after MF with components above? “Infused” just means you are able to place an Infusion into the item… So, after Infusing the item, it will have an empty “Infusion” slot.. You choose which infusion you want to place there. I should better ask what is the stat will get the infusion slot but not Tempered SB after MF with components above? Thanks for the great info Dulfy. One correction – the amount of iron ore should be 3 per ingot for both iron ingots and steel ingots in the Deldrimor Steel Ingot ingredient list, so 20 iron ingots / 60 iron ore and 10 steel ingots / 30 iron ore and 10 lumps of coal. Is that world gone MAD or it’s me? I started on that back pack but now, I realy regrette it!… it is totaly ridicullus the amount of stuff you need to make it! OO… sorry, am juste a fible smal time player that juste want to have fun! !… tho. Marie Cinnabar. But, ty for your impeccable infos. It’s cheaper then crafting other ascended back items. It’s also cheap to make it to exotic. Thanks for the info. The recipe on the Power Cores says incandescent dust, but it is in fact crystalline dust like you posted. if i equip and souldbind the exotic backpiece and then ascend it,does it become acc-bound again? Backpiece is account bound and stays account bound even after picking stats. I just made the blue version just to enter the purple portal and it says it’s soulbound after equiping it, no stats are selected yet. I’ve yet to upgrade it to see if it becomes accountbound again. I think they changed it, I did the fine and master version, after picking the stat, they become soulbound, they fixed the back piece. For the colored versions, does the recipe only work with the ascended version? I have already upgraded to ascended(infused) and would definitely like to change the color. that is so epic dude, grats! If I have a soulbound exotic back piece and then upgrade it to ascended, does it lose the soulbound? Dulfy do you know if you make it Static ( Red ) and you change your mind , can you make it Tempered ( Green ) ? Or you have to craft anotherone ? If I have the ascended version with stats already chosen, and I turn it into one of the colored versions, will it let me choose stats again? Yes, yes you will. However, you will also be forced to get another infusion since it’ll remove it. 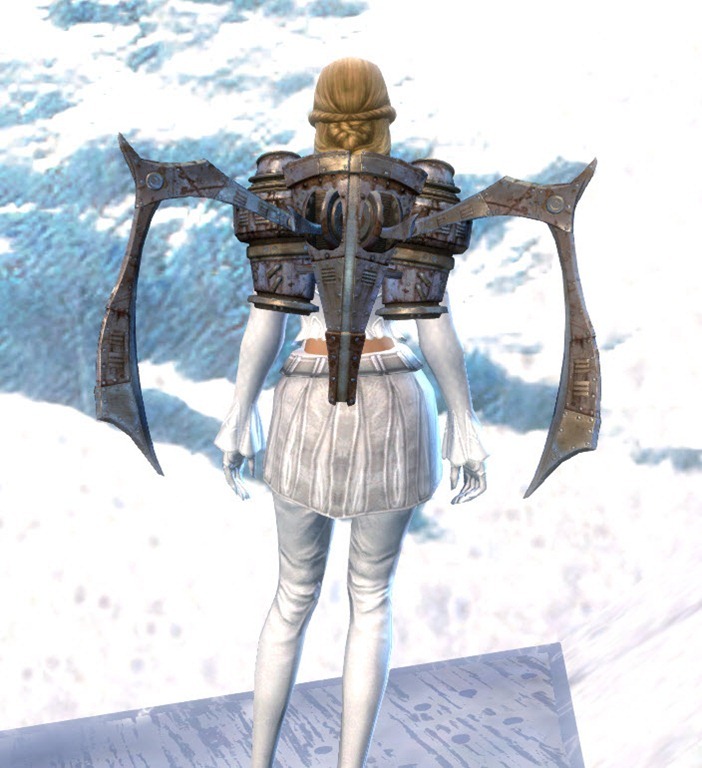 Here’s my thief wearing the Static Tempered Spinal Blade. You can update to this picture if you want. Hi Dulfy, If you have an already Infused Tempered Spinal Blade and upgrade it to Static, Dynamic or Synergetic, do you loose the infused option ? Does the Static, Dynamic or Synergetic Tempered Spinal Blade have different stats (offensive, defensive or utility slot). Hors is it just color ? I made Synergetic Tempered Spinal Blades by worng i meant to make Dynamic Tempered Spinal Blades ,, :/ is there any way i can change the color again? Do you have an update if theres a way to change the color? in the preview window, stowing a shield makes the colored ascended back piece disappear until you wield the weapon again. can anyone confirm if this is true or false in game? it’ll affect whether i make the red one for my pistol/shield engi or the blue one for my gs/staff guardian. its true. The backpiece also acts as if it were connected to the shield when you take your weapons out. It follows the shield then shoots back to where it should be. Barf! That’s only cool if it sticks to the shield when I throw the shield, but I’m sure that doesn’t happen. 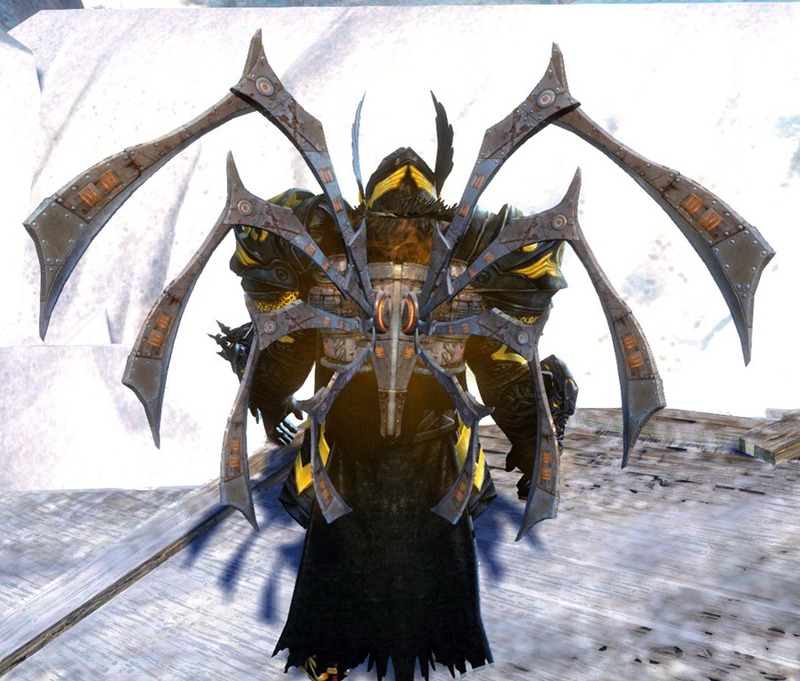 Alright, blue colored back piece for my guardian it is. you can also buy Obsidian Shards in the refugee camps for 50 belongings and some silver. which will yield 10-15 blade shards. Where’s the Mystic Forge now? It’s in Vigil Keep. Once you enter Vigil Keep (through the doors) follow the path past the dungeon vendors and you’ll see it. 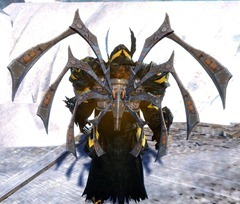 do Static Tempered Spinal Blades soulbind upon equip? 1 Augur’s Stone (20 skill points)” without having 500 on hunt/weapon. Hm, question: if I make on of these (let’s say ascended) and then transmute it, can I still enter the purple portal by Touma? 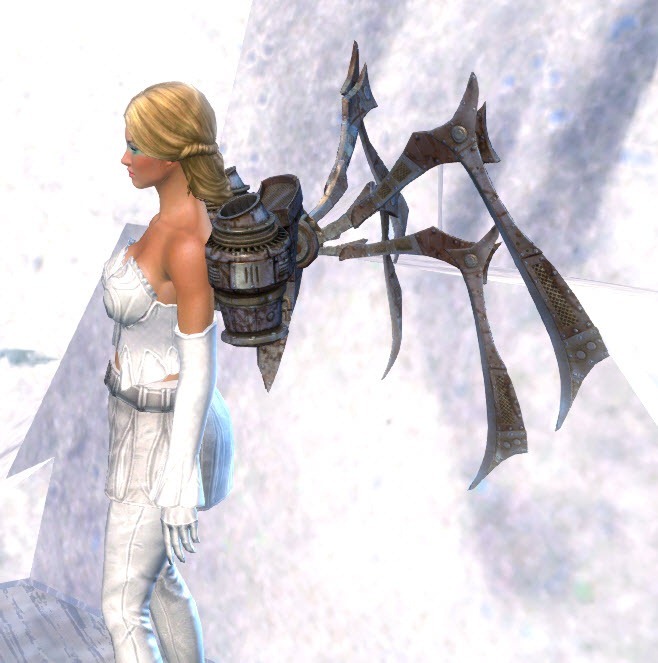 Dunno if it’s a glitch but I got my Mesmer into the purple portal w/o a spinal back piece. I messed this up! I crafted advanced, as artificer (500) Wore it. Now I can’t upgrade it to ascended! Thanks! I would never of figured it out. I really appreciate your help. Do I understand the guide right, that if I want to choose berserker stats, I have to craft the ascended version since you can only choose between some stats at lower quality? Oh my fault maybe, at first glance I didn’t realize that but yes, I got a “Lesser Vision Crystal” too. At first I didn’t see the difference. But question remains, is it the default reward for doing that instance, or is it a random reward? Sorry for any mistake btw. me and a friend got it too at first time completing it. so my guess is: standart loot. as far as i know “lesser vision crystal” is used in crafting ascended armor only. Hi. Does someone know if Magi stats (Healing, precision, vitality) are also available for ascended Version? You can select Magi on the exotic version, so it stands to reason you’ll be able to pick those stats on the Ascended as well. It is not on the ascended version, I wrote down all the stat combos in the ascended section. Those are what is available: Apothecary, Berserker, Berserker and Valkyrie, Cavalier, Celestial, Cleric, Dire and Rabid, Knight, Precision Power Toughness, Rabid, Rabid and Apothecary, Rampager, Solder. 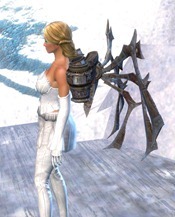 Does anybody know if there is a time limit on crafting this backpiece? will I still be able to do it after event ends? I haven’t been able to play in over a month, and I still would have to level one of the crafts that i dont have to get this. Yes, you’ll be able to make it after the event ends. You can buy the blueprints to make the first stage off of the trading post and the spinal blades will continue to drop of aetherblade enemies long after the event is over. Might take you a bit longer, but it will be available to you. 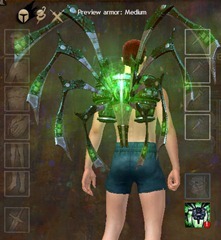 Is it me or is it MUCH cheaper to infuse any of the three colored ascended spinal blades than the uncolored one? 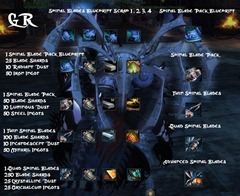 According to this, the tempered spinal blade requires 250 ectos, while the dynamic/static/synergetic do not. Hi Dulfy, assault knight power cores do not drop from knight of the associated color. Once any knight is beaten, everyone participating gets a chance of up to 3 cores of random colors at the end of the knight event. Thanks! Am I right that now it is impossible to get blades for this craft as the event is over? which of those three professions is cheapest to max to 500? I don’t know where the recipe went for the infused ones but its tempered spinal blades+ X Assault Knight Power Core + Gift of ascension + Coagulated mist essence. Once youve made your ascended colored version of the SPinal blades pack, can you say, change the color? I messed up and picked the wrong stats and was hoping to find a way to change the stats through changing the color. I am guessing I am pretty much screwed on this as I tried to change the color but the forge would not accept the pack since it is ascended. Sadly I have a knack for asking the wrong questions. WHat I really want to do is change the stats. I picked berserk stats for my guard and needed Power Tough Vitality type stats is there a way to alter the piece to change the stats or is it a lost cause? See heres the thing. I think it is completely finished. However, it only has 1 infusion slot. should it have 2? If it should have 2 I might be able to change the stats. otherwise I just might have to make another if necessary, though i might just leave it as is. On the wiki it says Account bound, but when you infuse a colored one it says Soulbound on use. 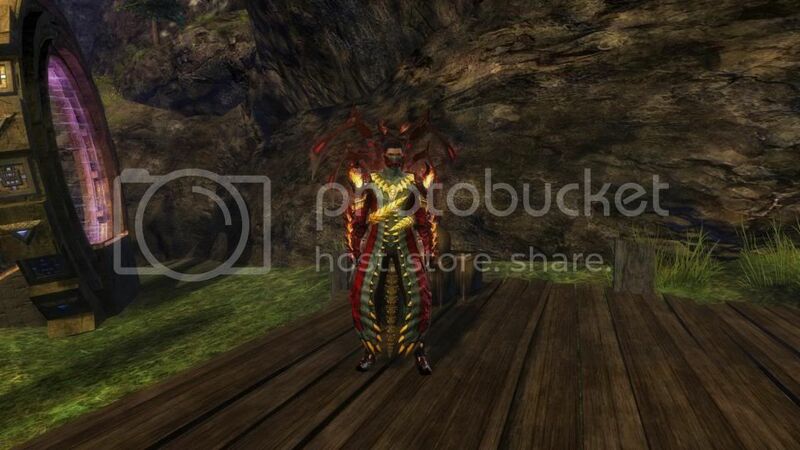 Can anyone verify whether or not these become soulbound after color + infuse? All ascended items are now account bound. This was not the case when this item and this guide was released. is there any way to get blade shards other than the forge, now that the event is over? The watchwork sprocket node in home instance gives shards occassionally, they also randomly drop from aetherblade mobs (at the JP or in EotM). The mystic forge receipt is actually the best and fastest way to get the blade shards. Today i`ve spent 150 Gold for 1015 Blade Shards. i have a “Twin Spinal Blades” and i have all material for upgrade the backpack on “Quad Spinal Blades” but the forge will not let me upgrade the backpack. someone has an idea why ? Hi, how can I obtain blade shards nowadays please ? I get it for the MF recipe, but I need to have at least one to be able to get more of them using the MF. Can I find aetherblade ennemies out of donjons for example ? Find someone who has the sprocket node in their home instance and harvest it every day. The guide doesn’t mention that you can infuse and colour in one step, which is considerably cheaper than using two steps. The cores cost so much now it is crazy 100g for a color change is just too much for my taste. This guide should get a big message at the top saying these cannot be made anymore, unless certain circumstances are met. Saves a lot of research. Which I had to do as a new player. Can still be made; almost done making mine…. 4/14/15. Getting the materials is near impossible. This was intended to be made during the Escape from Lion’s Arch event. The Blade Shards alone are almost impossible to get in the great numbers necessary. This guide was clearly intended to be used during the event, so therefor my point still stands: it needs that message. I put 5 alts at the chest of the Aetherblade jump puzzle and have over 750 blade shards after 1 month just from opening it daily on each toon. Had to level my armorsmith high enough to get the deldrimor steel ingots and have now made the ascended pack as of today. Its taken three months (bladeshard farming and leveling up crafting) but I’ve made my first Ascencded piece of armor; finished it today. 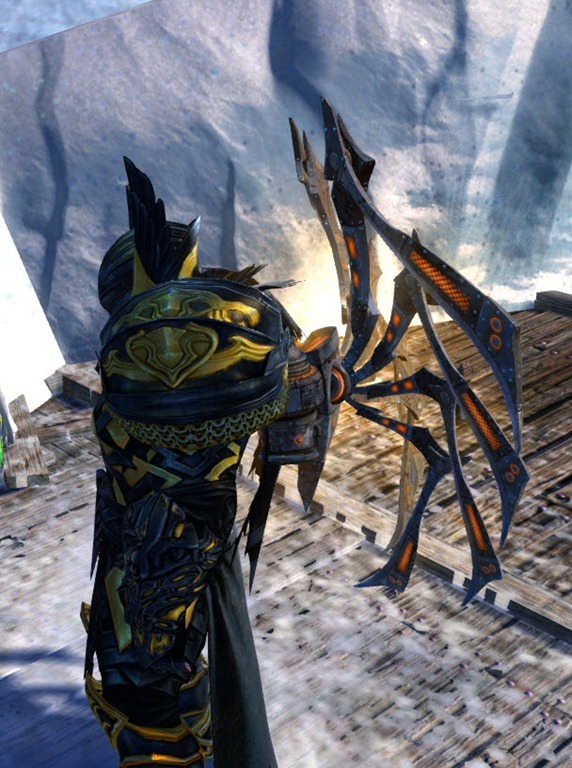 The Ascended Spinal Blade back-piece looks shmexay on my warrior! Thanks for the guide! so is it not possible to get the items to make the back item as of now ? I done mine 10/03/2017 following this guide and infused it to blue,but i was wondering about if i can change their color again and unlock all colors or i need build a new one and change it to other color. Someone know if is possible use the same to switch to all colors ? I’d love to know that as well. I have a red one, but I want blue and green as well.